The issue of weight is often discussed as to the novice or person unfamiliar with them, a Sighthound appears to be bony and skinny and there is no understanding of the reasons why they look different from some other breeds. As they SHOULD. 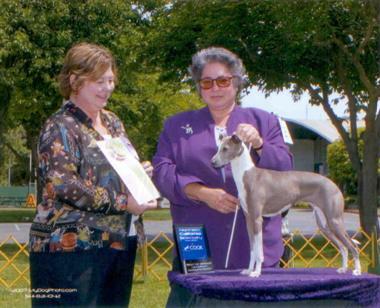 It is often very disheartening for breeders and Rescue folk to see a Sighthound, and in the IG’s case, an Italian Greyhound looking like a Beagle on stilts. That is not what they are built to look like. Nor is it at all healthy for them. Sighthounds are built on a very lean frame and with an exceptionally deep narrow chest for a reason. They have immense lung capacity built into those bodies for speed in the desert sands where they originated. They tend to be sprinters, but they have lightweight frames meant for traveling without constant access to food and water. And genetically they really have very little fat on their bodies, nor should they. It is for this very reason that one must be extremely careful when a sighthound must undergo anesthesia. Without the fatty tissue on their bodies, many anesthesia's are such that the dog may not wake up. Only two specific drugs are ever recommended for any Sighthound, Isofluorane and Sevofluorane. When you look back historically at any of the murals/paintings/drawings/books etc. that show Sighthounds and Italian Greyhounds, you will notice one very consistent similarity. They ALWAYS are shown with a lean frame and no body fat. 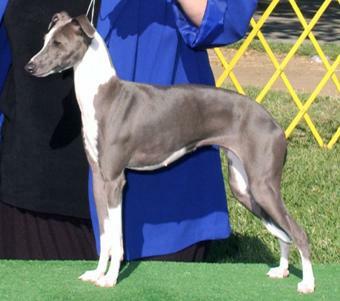 It is most often said by breeders that for an Italian Greyhound to be in “proper” weight, you should see a hint of the ribcage as they move, at least a hint of the hip bones and about 3 vertebrae prominent on their backs. And always, as in Sighthound structure, a “tuck-up” or defined area between the hips and the ribcage that tucks upward toward the spine, usually called the “loin” area. behind the last rib bone. And this is Lizzie at 8, still in great shape. One of the worst things you can do to a Sighthound is to keep extra rolls of fat them, as it taxes their heart and diminishes their lung capacity and makes deep breathing very hard work for them. Even if all this were not true, just think of the narrow IG frame and structure.... Everything is held up by their very narrow little legs. Those thin legs have enough to deal with just holding up their bodies, but to add rolls of heavy fat only makes them more prone to imbalance, and possible leg breakage as they fly around as IGs are wont to do. So, what is healthy and a good diet for an Italian Greyhound to keep them in good weight? One thing to keep in mind is that there is NO PERFECT diet for all dogs. Some do better on kibble, some on raw, some on high end food, some on mid-range quality foods. A lot depends on how they were raised, and following through with a diet you can feel good about. Most importantly, no matter what food you decide upon, consistency is key, and you need to go by WHAT you see, not WHAT you feed, or how much. A dog may do well on 1 cup of kibble a day, and another may need only 1/2 cup. Try to avoid supermarket foods as they tend to be the lowest quality food available. However good quality foods are available in some unlikely places as well. Start with your local petstore, or feed store and do your research. There is a lot of good information on the internet and as well there is a lot of MIS-information on the internet. What you need to look for is healthy teeth, healthy shine to the coat and healthy muscling on your dog, a firm stool quality is important. What you need to NOT SEE is fat rolls around the neck or back or shoulder, or thick Dachshund-like bodies on long thin legs. The general rule of thumb is stay away from Corn and Wheat as they are culprits for allergies. Rice and brown rice and other carbs are better ingredients. Stay away from ‘fillers’. Try to find foods that have Meat or Meat meal in the very first ingredients and keep carbohydrates further down the list. Avoid foods with so many different protein and carbohydrate sources in them (even if they are good quality foods), as if you find an allergic reaction you will not be able to identify what the culprit is. I tend toward foods with a moderate protein/fat level and add those to my dogs’ foods as a topper based upon the exercise they are doing each day. But mostly I tend to stay within the balance of the already nutritionally balanced food I feed them. Remember that treats also have calories, and dog biscuits are not all that different than dog food, some are healthier than others, and have the same ingredient issues as dog foods. Find ones that balance with what diet you are feeding or only use foods you have in the house already for treats. For instance, my own dogs do not do well on some of the higher quality foods on the market, too many ingredients and sometimes too rich for them or too high protein content. I happen to know that the kibble I feed which is sold by Costco under their own label, is made by a company that makes a lot of high mid range foods, Diamond. And the ingredient list is similar, if not exactly like another food made by that company but sold at a much higher price. So research is very helpful. There are a number of great foods on the market these days. For my dogs, I feed a mid-range kibble, and add 1/2 tsp to 1 tsp. of fresh cooked chopped chicken thigh. As a treat or also a dinner additive I use fresh cooked red yam in small amounts 3 to 4 days a week. The dogs love it more than pumpkin, it has great anti-oxidants and fiber and is great for their digestion. I might use a teensy piece of cheese or a piece of carrot or even their kibble itself as treats during the day. But one important thing to keep in mind. EVERY thing you put in their mouths has calories. So in order to keep them in ideal weight, you need to factor everything you feed them into the overall total of their diet. On days my dogs do heavy exercise (running or fetch), I may increase their intake just a bit, on days of lazing around, I use a base amount of food. To keep your Sighthound in ideal weight, you need to pay close attention to what you SEE, not what some package tells you is the correct amount. I know it’s very easy to let a dog’s weight creep upward, just as easy as with ourselves. But it’s not hard to adjust the food intake accordingly, in fact I find it much easier than adjusting my own food intake. If you need to diet your dog, it’s pretty simple. Just cut down the portion size by 1/4 to a 1/3 and wait and see. Try to increase the activity and exercise to round out a healthy dog. Some people use a ‘green bean’ method, meaning they add green beans as ‘filler’ to the dog’s food, but a caution here. IF you do that, you still must cut down the portion size, you can’t increase their food intake with green beans and expect they will lose the weight unless you still cut down the calorie level. I personally don’t do this, I just cut down the food intake and increase the exercise. I wish I could do the same for myself as easily. A happy, healthy IG is one who moves freely and prettily, and doesn’t get winded as they play. An obese IG cannot do this. Best wishes for you and your healthy Italian Greyhound. What should an Italian Greyhound Look Like?